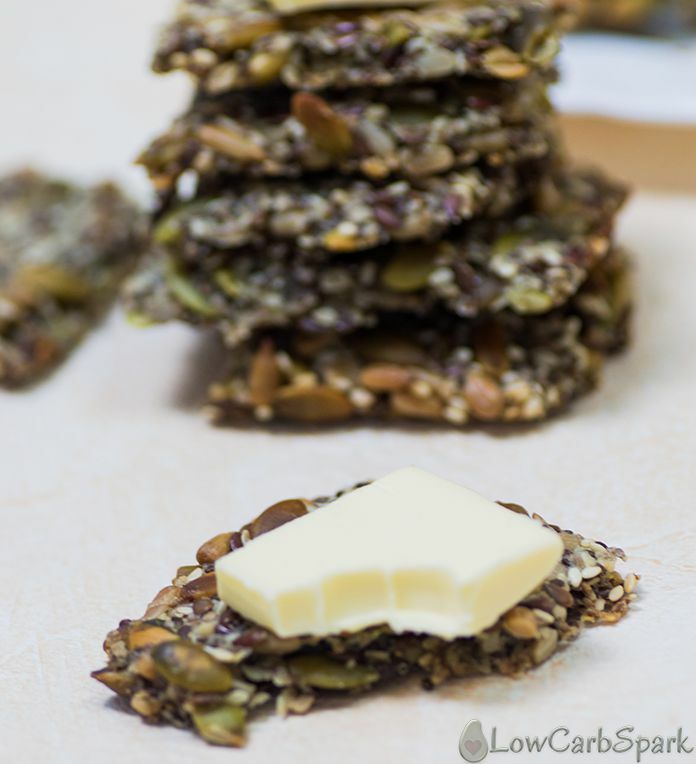 One of the best keto cracker that I created by adding all the nuts and seeds I had in the pantry. Finding easy to make low carb snacks is not an easy task, but today I am sharing with you one of my favorite recipes. At first, I thought it was a weird combination, but after I baked the crackers and let them cool down, I ended up with crispy and salty goodness. If you are looking for something low in carbs to snack on, you are in the right place. After I made my first batch, I made another one to have on hand for the whole week. The crackers are great for dipping, eating them topped with butter and delicious on their own. Who says you can’t enjoy a good crunch when switching to a keto lifestyle even though chips and grains are not on the allowed food list? Well, some people suggest eating a few slices of cucumber when looking for quick low carb snacks, and while that’s a good idea and will make you eat more vegetables; for me, it’s not satisfying enough. 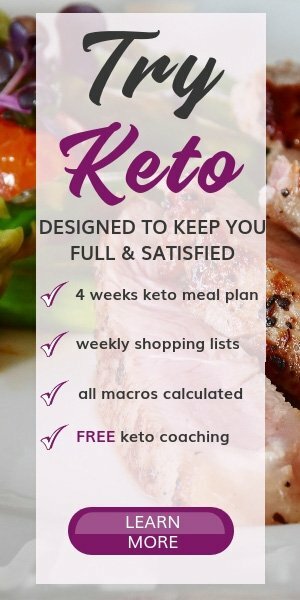 You can definitely buy healthy keto snacks on Amazon or from any other health store, but they usually have added ingredients that are not keto compliant or are insanely expensive. The crackers are good to eat on their own as a quick low carb snack, but I prefer them better topped with a high-quality grass-fed butter and salt. You can also dip them in guacamole or other keto dips. 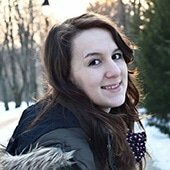 I also gathered a huge list of 54 quick low carb snacks you can enjoy while following a keto diet. It includes both sweet and savory snacks idea. 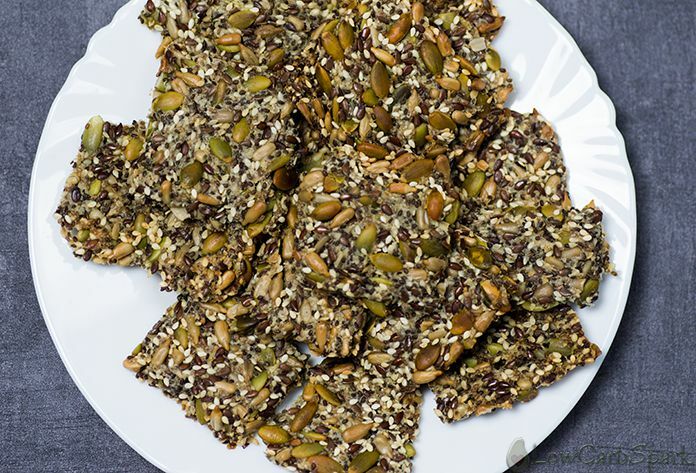 To make this recipe I use all the seeds I have at home, almond meal and coconut oil to bind everything together, add extra healthy fats and ensure that the crackers will turn out crunchy and golden. The flaxseeds and chia seeds are essential to use in this recipe because they help the ingredients bind well. You can substitute one for another but use the same total quantity. For example, if you don’t have chia seeds, use 1/2 cup flax seeds and vice-versa. Gather all the seeds and nuts you can find in your pantry. You’ll need about 1/2 cup of each. The most important are the chia seeds and the flax seeds. Use hot boiling water to activate the chia seeds and flax seed. These two small seeds act as a binder. Use 2 tbsp of coconut oil or butter to make sure that the crackers turn out perfectly crispy and roasted. Bake on low temperature for half an hour and then cut them into pieces. Let them cook for another 30 minutes or until all the moisture is gone. Enjoy them plain or with butter on top! 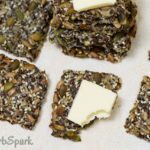 How many carbs are in the keto seeds crackers? Following the recipe and the same amount of ingredients will end up having 40 delicious and crispy crackers. 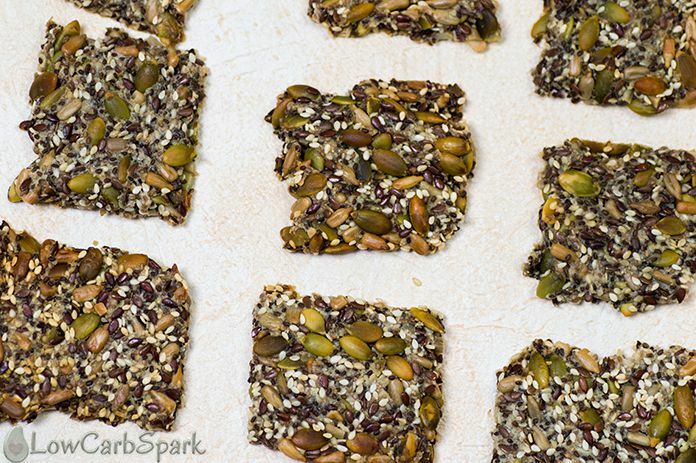 Super easy to make low carb crackers that are healthy, high in fiber, omega3 fatty acids. With only 1g net carbs per serving these crackers are super crunchy and taste fantastic topped with butter or dipped in a low carb sauce. Preheat oven to 300F / 150C. In a bowl combine the seeds, almond flour, and coconut oil. Add the boiling water and stir well until the coconut oil is melted. Let the mixture sit for 20 minutes until the chia seeds and flax seeds gel. Place seed mixture on a sheet of parchment paper. Use the back of a spoon to flatten seed mixture as thin as you want. Bake for 30 minutes, then remove from the oven. Using a sharp knife cut the crackers into 1-inch squares, then remove them to oven for another 30 minutes or until there’s no moisture left. Let the crackers cool down on a rack, then sore them in an air airtight container. Loving your recipes! Thank you for all of this. My family are fussy eaters so won't eat seed bars so I wondered if you have tried grinding the seeds (to disguise them). Does the recipe still work? I've never tried grinding the seeds but I have the feeling it will work just fine. If you try it let me know how it turned out. I made these last week and I’m now making another batch. It wasn’t until 4 days later I found out how delicious the crackers are with strong cheddar cheese. Yesterday Hubby brought some out to the garden with cheese and pickled onions hmmm even tastier. I’m now experimenting to make a sweet version at hubby’s request. Hey, that's awesome. I am super happy you loved the keto crackers. They are super easy to make and I am always snacking on them with butter on top! Great recipe base. I make a garlic salt and rosemary one for a savoury flavour. For a sweeter batch I drizzle dark chocolate with a pinch of pink salt over the crackers once they have cooled down. This was so good! I'm a bloke who works from home and wanted to make a nice day time snack. This caught my eye as something that my partner could also enjoy as she has low carb requirements. I didn't have many sesame seeds left, not even a quarter cup, but it still worked. After the recommended baking time mine were still chewy and too moist. I cranked the temperature up to 180C (355F) and changed to fan forced for about an additional 20 minutes. Perfection. I'm addicted to trying these will all sorts of different condiments. So far Vegemite is my favourite! 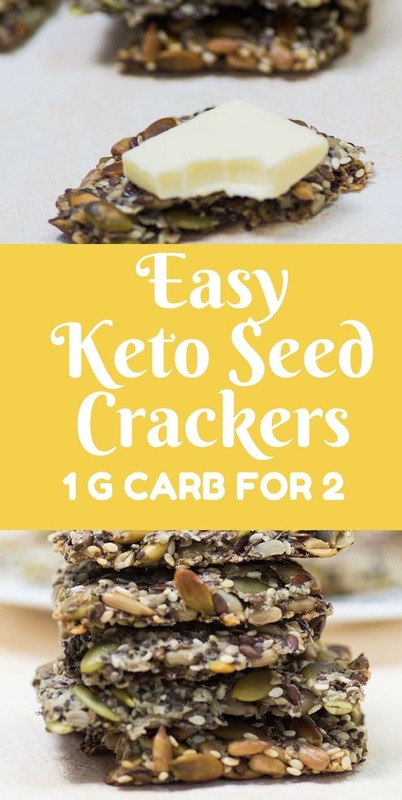 Love the recipe and even more so as I’ve just put the nutritional information into Cronometer and as the carbs are 1g per 2 crackers and fibre is also 1g the net carb calculation used for keto diets is 0g! I can not believe how great these turned out! Thank you! This sounds delicious, but will those chia seeds continue to expand in the stomach? They are already expanded by the time you bake them.